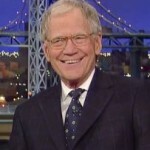 From Mediaite: David Letterman is retiring. Writes Mediaite, “David Letterman will be announcing his retirement from The Late Show in 2015 on Thursday night’s episode after over three decades in late night television on two different networks. The news comes just months after longtime rival Jay Leno made his big exit from late night.” Read the full story here. 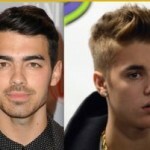 From Gossip Cop: Joe Jonas said he saw Justin Bieber’s downward spiral coming. Writes Gossip Cop, “ The former Jonas Brother shares, “I’ve had an easier route than most. The youngsters just turning 20, the Biebers of the world, are under a microscope.” Jonas says that Bieber is “having a very tough time finding balance,” adding, “I think we all saw it coming. Your dad is your party animal — that’s going to sum it up pretty quick. There’s an equation for some sort of explosion.” Read the full story here. 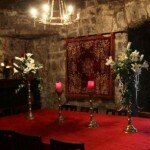 From Geekosystem: You can now rent your own castle… for a pretty steep price. Writes Geekosystem, “So apparently renting castles is a thing that people with exorbitant amounts of money do sometimes, I’m told. And sure, Casterly Rock isn’t exactly real or anything, but if you’ve got more metaphorical gold than the Lannisters, what’s to stop you from renting a castle just like theirs for a weekend? Nothing, that’s what. HomeAway, a travel service that specializes in fancy home rentals all over the world, took great care in searching through their multiple castle listings and selecting those that they feel come the closest to the mighty houses of Westeros.” Read the full article here. From Styleite: Naked yoga? One writer went to investigate. Writes Styleite, ” First of all, the sign-up process for naked yoga is intense and vaguely offensive. Before you can register for a class, you first have to fill out this bizarrely limiting questionnaire, the purpose of which I assumed was to assess your comfort and experience levels. (Also, to confirm that you weren’t a weirdo who was planning to perv out on a room full of naked people in a disrespectful manner.) And, in part, it was. The more standard questions included: “Why did you respond to Bold & Naked?” “What would you like to get out of participating in Bold & Naked yoga events?” “Are you comfortable being touched non-sexually?” “Describe your yoga experience. What style of yoga are you practicing and for how long?” And that was fine. Other questions, not so much. For starters, the gender options listed for you to choose from are “Mr.” or “Mrs.” Aside from the fact that this leaves out a broad swath of gender identities, which is bad enough in itself — “Mrs.”?! My only choice is to identify as a man or a married woman? Okay, then. Naked Yoga thinks I’m a married woman.” Read the rest of this article here. From SportsGrid: The University of Georgia is now using art to recruit football players. 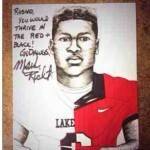 Writes SportsGrid, “New strategy in the college football recruiting wars: Georgia is sending sketched portraits to potential recruits, showing them what they’d look look like in (half of) a Bulldogs’ uniform…The sketches are signed by Georgia head coach Mark Richt, but I’m assuming he’s not actually drawing them. NCAA violation! Just kidding. But wouldn’t be surprised if it was.” Read the full story and check out the sketches here. From The Mary Sue: Johnny Knoxville and Tony Shaloub will voice main characters in Teenage Mutant Ninja Turtles. Writes The Mary Sue, “One of these men will voice Splinter, while the other will be one of the four turtles. So this is weird. We know voice actors are sometimes cast at the last minute. Or at least announced at the last minute. Think about how long it took to get actual confirmation on Groot and Rocket Raccoon for Guardians of the Galaxy. But, the Michael Bay-produced Teenage Mutant Ninja Turtles already had its turtles cast. Alan Ritchson is Raphael, Jeremy Howard is Donatello, Pete Ploszek is Leonardo, andNoel Fisher is Michaelangelo. Seinfeld‘s Danny Woodburn was playing Splinter. 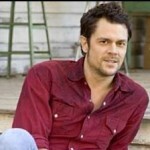 So why has Johnny Knoxville just been cast as the voice of Leonardo with Tony Shaloub as the voice of Splinter?” Read the article here to find out. From The Maude: Did you miss the most incredible event to have ever happened in the history of the world? Writes The Maude, “First of all, the lights were unlike anything I’ve ever seen before. You don’t usually notice lights — if you do, it’s either because they are horribly wrong or mind-blowingly perfect. In this case, they were the latter. The lights were set in such a way that — you know, it’s so hard use words to describe what the lights were like. You really should have just been there. Have you heard of Woodstock? Yeah? This was more fun than that. 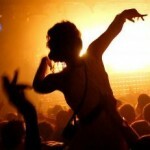 Can you picture Ibiza? Really picture it? Okay, now throw away everything you know about Ibiza. It was just like that. None of us knew what we were getting into.” Find out what it is and read the full story here. From The Braiser: Nigella Lawson is barred from entering the U.S. for admitted drug use. Reports The Braiser, “The Daily Mail reported yesterday that the notorious arsonist, drug lord and jaywalker known as Nigella Lawson was barred entry into the United States yesterday, which is a good thing, because America would never allow a bad, evil person like Nigella Lawson into the US. Psych. Nigella Lawson did none of those things. Nigella Lawson only admitted to occasional drug use back in December. But the part where she was banned from entering the US is completely true.” Read the full story here.